Here’s a round up of some recent coverage of Books for London and some things that we’ve seen in the past few weeks that we thought were really quite neat. The byline for the London Living blog is ‘Shining a light on the everyday issues that matter to Londoners’, so it’s been a great privilege that they’ve done not one but two blogs featuring Books for London in the last month! Books for London was featured in their Top 5 picks, and then a week later with a post on the campaign. They say that “As well as blogging about the development of their campaign, the Books for London blog is also a treasure-trove of information for book lovers in the capital, with information about upcoming book swaps, sales and give-aways.” Thanks for that London Living! We urge you to check out their website and to follow them on Twitter! This is the kind of book swapping that we really like (and dream of at the moment!). MA Fashion Curation students at London College of Fashion have recently set up a book exchange on Carnaby Street. Located in Kingly Court, just off Carnaby Street, you can even share your thoughts and recommendations on the book you are leaving behind, with the swapping concept not only involving the sharing of books, but also the sharing of memories. Carnaby is world renowned for being an incubator for fashion, music and style-tribes. The Carnaby Book Exchange will serve as an incubator for a passion shared, at what will possibly be London’s most diverse book club. We love the idea of book swapping going beyond just books, to ideas and memories – fantastic! 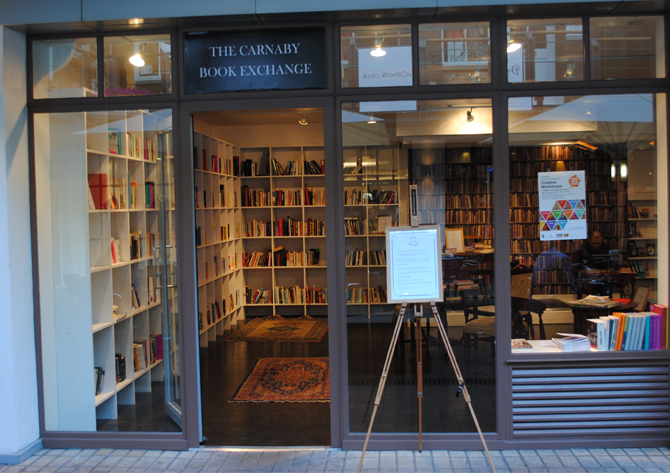 More info about the Carnaby Book Exchange, including opening hours is here. Have you seen anything really great that’s book or swapping related recently? Let us know and we can add it to our round up! « Can you spare an hour in Ealing to help Books for London between now and Tuesday?